Do these terms matter or make a difference when it comes to medical devices and working with the FDA? Yes, they do! Mike Drues of Vascular Sciences joins me to talk about the differences between clearance vs. approval vs. granted, which are the three most common ways medical devices are brought to market. Clearance: When a 510(k) is cleared from the FDA. Approval: When a PMA is complete. Granted: When a De Novo is complete by the FDA. There are reasons to get angry when medical device companies use incorrect terminology. What other mistakes might they be making? Riegel v. Medtronic Case: U.S. Supreme Court held that the level of safety and effectiveness of a PMA medical device is higher than a 510(k). There are pros and cons to each pathway. Know all your options because 510(k) is not necessarily the best. Companies should not avoid PMAs as a convenient excuse because they think extra time, work, risk, and investment are involved. Instead, pursue them. The safety and effectiveness of a medical device is never dependent on whether it is cleared, approved, or granted. So, set the bar high on its worthiness. Announcer: Welcome to The Global Medical Device podcast where today's brightest minds in the medical device industry, go to get their most useful and actionable insider knowledge, direct from some of the worlds leading medical device experts and companies. Jon Speer: Clearance versus approval versus granted. Do these terms really matter. Do they make a big difference when it comes to medical devices and working with the FDA? Yeah, you bet they do. 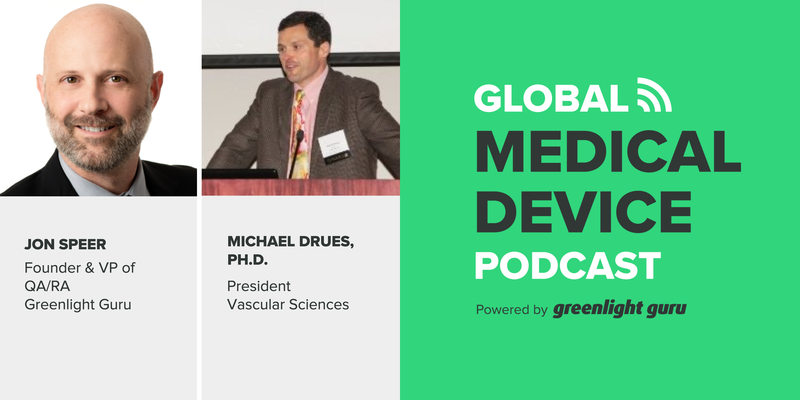 And listen to this episode of The Global Medical Device podcast, where Mike Drues from Vascular Sciences, and I explore the difference between clearance, approval and granted. Jon Speer: Hello and welcome to The Global Medical Device podcast, this is your host and founder, and VP of Quality and Regulatory at Greenlight Guru, Jon Speer. And with me today, I have Mike Drues from Vascular Sciences. Mike, welcome. Jon Speer: Well, Mike, in recent news there were some big name company that got a new device or a device that was actually now recognized as a medical device. And I noticed in the press release on the particular product they were... I think they're pretty confused about some of the terminology, the regulatory terminology. They were interchanging the words approved versus cleared and that sort of thing. And I see this a lot, actually, where somebody would say, "Oh we just got our 510(k) approved." Inside of me, I'm like, I wanna correct them. I want to make sure they're using the right terminology on these sorts of things. So I thought you and I could spend a few moments today talking about the difference between clearance and approval and granted, and how those terms really do matter and how they tie to certain types of classifications and types of regulatory submissions. Does that sound okay with you? Mike Drues: That sounds like a great topic to talk about, Jon. Happy to be part of the conversation. Jon Speer: Alright, so... I guess first question for you is, do the words really matter? Does it really matter if I say, clearance versus approved or if I interchange those words? Does that really make a big difference? Mike Drues: Long story short, Jon, it does. Depending on who you ask it can make a great difference, and we'll talk more about that in a moment, but perhaps before we do, we should just make very clear to your audience, what those terms refer to. So as Jon was describing when we talk about clearance versus granted versus approval, we're talking about three of the common ways that medical devices are brought to the market here in the United States. The pre-market notification, also known as the 510(k), the de novo and the pre-market approval also known as the PMA. Those are the three most common, they're certainly not the only ways that medical devices can be brought to the market, but those are the three most common. Let's see, Jon, when a 510(k) gets a successful... I'm sorry, when a medical device company gets a successful 510(k) from the FDA what is that called, of those three choices, it's sort of like a multiple guess. Jon Speer: Sure, that is clearance. Mike Drues: That's correct, when a 510(k) is complete, it's cleared by the FDA, when a PMA is complete, what do we call that? Jon Speer: That is approval. Mike Drues: That is approval, PMA, pre-market approval. So that's an easy one to remember. And, finally bonus question, although this is a process of elimination. So the third choice when a de novo is complete by the FDA, what do we call that? Mike Drues: Granted, and granted by the way, is a relatively new term, it was just introduced by FDA in one of the new de novo guidances last year. So when a 510(k) is completed, it's clear when a PMA is completed, it's approved, when a de novo is completed, it's granted. More importantly, why does it matter in terms of the terminology, because in regulatory affairs, terminology does matter. You're exactly right, Jon, I see it myself as well. Sometimes in the press releases from some of the largest medical device companies on earth. I will see they say, "Our 510(k) was just approved," and simply put that's a factually incorrect statement. A 510(k) is never approved. And a lot of people say, "Well, Mike, why do you worry about such a thing? It's just a matter of semantics. Why do you get upset if a company says their 510(k) is approved?" Jon, do you have any thoughts as to why that would bother somebody like me so much. Jon Speer: Well, I think it goes back to the, really the notion, or the premise behind what a 510(k) is. A 510(k), you're demonstrating substantial equivalence to a predicate device, so it's not FDA evaluating your product and it's safety, and efficacy all by itself, it is FDA reviewing your product compared to something else. So they're not really going to approve your product because of your comparison to another product. Mike Drues: That's certainly correct, and that's part of the answer, but it's not the entire answer. There are other reasons why we should get upset when we hear a medical device company, make that kind of a mistake. And here's the main reason why I find it frustrating is because one of the things that I've learned in dealing with my product liability attorney friends is that when I'm working as an expert witness in a medical device product liability case, if the opposing counsel objects to any one aspect of my testimony, in other words, if they can show that just one thing that I say is incorrect or is wrong, then my entire testimony can be thrown away. So if this medical device company, even if it's one of the largest medical device companies on earth, makes this one seemingly simple mistake, like saying their 510(k) was approved rather than cleared. What other mistakes might they make... Be making? That might not be quite so seemingly trivial. So, for better or for worse, terminology does matter. And there's a third aspect of why the difference between clearance versus approval is so important, and that is, when it comes to product liability. Are you familiar with a US Supreme Court case from about a decade ago called Riegel versus Medtronic? Are you familiar with that case, Jon? Jon Speer: Just vaguely. I know this is an area that you often caution companies on the topic where a lot of people have a fear of the FDA, and I've heard you advise more than once that you should have a healthy respect for FDA, but it really is the liability attorneys that you should worry about. So tell us a little more about this Supreme Court case. Mike Drues: So first of all, I'm not an attorney, nor do I play one on TV. But this particular case, Riegel versus Medtronic from 2008, and we can provide a couple of references for your audience on the website if you want, is one of the most important medical device cases in US Law in my nonlegal opinion. Because basically a decade ago, the US Supreme Court held, and I'm gonna greatly simplify this, that the level of safety and effectiveness of a medical device for... A PMA medical device is much higher than it is for a 510(k), and as a result, it's much more difficult for somebody to sue a medical device company, with a PMA device than it is a 510(k) device. In other words, and I'm gonna try to make this as simple as I can, and I apologize to my attorney friends for any oversimplification. But medical devices brought on to the market under the PMA are held to a much higher level of liability... A higher level of liability than a 510(k). It's much more difficult if a patient is harmed by a PMA device, it's much more difficult for them, but certainly not impossible, but the burden is much higher for a PMA device than for a 510(k) device. Mike Drues: And I can tell you from personal experience in some of the other cases that I've been involved with the courts, as a general rule, they are not fond of the 510(k). As a matter of fact, I've had some attorneys tell me flat out that they have no respect for the 510(k) and they actually love going after companies with a 510(k) device, in part because of this Riegel versus Medtronic case that I've been talking about, where the Supreme Court has held that it's basically easier to sue a company with a 510(k) device over a PMA. One last thing that I'll just mention very quickly, Jon, and I would love to hear your thoughts and your experiences on this but. And I've said this, I'm sure in some of our previous discussions, as well. I often hear people tell me they're striving for regulatory compliance, or quality compliance. When you think about it, that's a pretty low place to set the bar. Mike Drues: When a medical device company gets a 510(k) clearance, when their de novo is granted, when their PMA is approved, when they get ISO blah, blah, blah, certified, when they get a CE mark, that's the academic equivalent of being a C student. That just means that you're passing, that does not mean that you're making a great product. And how many times in the history of man has it happened where a medical device, or a drug for that matter, has gotten onto the market meeting the regulatory requirements that existed at that particular time, only to go on to cause harm to some people and in some cases even kill people. Mike Drues: And sometimes as a result we raise the regulatory requirements. But remember, Jon, hindsight is always 20-20. So 20 years from now, 50 years ago, 50 years from now, when people look back at what we're doing now, what our regulatory requirements and our quality requirements are from 2018. Aren't they gonna be saying the same thing? Interesting to think about. But any way we can put some information on this particular case on the website if people are interested, what are your thoughts on all of that, Jon? Jon Speer: Well, I was thinking a little bit about the conversations that you and I have had previously in... There are strategic advantages as to why I may want to go down the clearance path versus the approval path versus the granted path. And I thought, in addition to talking a little bit about the differences between those three terms, maybe spending a few moments talking about some of the advantages or disadvantages of each and you've hit on a couple of things, but... What are some of the pros and cons, versus getting the clearance versus approval versus granted? And I know there are numerous for each, but I thought maybe if you could share maybe a couple thoughts about pros and cons of each of those different pathways. Mike Drues: Yeah, I think that's a great question, Jon, because you're exactly right. There are advantages and disadvantages to everything. There are pros and cons to each of those pathways, as you just very eloquently described. So we've talked a little bit about terminology we've talked even a little bit about product liability. Let's talk about a few others. One that comes to mind is something I call competitive regulatory strategy. This is a topic that you and I have also talked about in the past, and I've even done webinars in the past, but bottom line as I'm sure everybody in your audience would agree, the 510K is the most common pathway to market for medical devices here in the US. And in many cases there are advantages to the 510(k). But in some cases, there are disadvantages as well. There are some very significant advantages to a de novo, or even a PMA over a 510(k), one of them being competitive regulatory strategy. Mike Drues: I won't talk about that in detail we can provide some links to some of the previous work that you and I have done in this area, but for those in the audience that are not familiar with this, the idea of competitive regulatory strategy is not simply following the leader, that is following the path... The regulatory path that somebody took before you. But rather creating a new path, such that it's more difficult for others to follow, in your footsteps and using the de novo over a 510(k), or using a PMA over a 510(k) can help set up some very significant, I don't wanna say barriers, but certainly big speed bumps in the road that would make it more difficult for your competitors to follow in your footsteps. Another thing that we have to keep in mind is the importance of reimbursement today. Once again, from a reimbursement or a health economic perspective, there are some very significant advantages to bringing a device on to the market under a de novo or perhaps even as a PMA, as opposed to a 510(k). Mike Drues: You're laughing, Jon, but that actually happened, it's a true story. And so simply put, if we don't know all of the different options that we have, all of the different pathways to market, and by the way, the three that we're talking about, the 510(k), the de novo, and the PMA, those are only three of the seven major options that we have to bring medical devices onto the market here in the US. If we don't know what all of the options are and the advantages and disadvantages to each and everyone, then how can we possibly know, which one to use in our particular situation, in other words, how can we do our job? Jon Speer: No, that's a really good point. And so, folks talking with Mike Drues from Vascular Sciences today, and we're talking a little bit about the terminology confusion, specifically, clearance versus approval versus granted, and really how this ties into your overall competitive regulatory strategy. But it's a really good point, Mike. I do think that, if you look at the stats and I don't remember them off the top of my head, but it's pretty overwhelming. That majority, the vast majority of medical devices are going through this 510(k) pathway to get the necessary blessing, if you will, from FDA. And it's a good point, if there are seven pathways and I only know about one who's to say that that is the best pathway for my product. Folks, I recommend that you really understand what those options are as far as these seven different paths. Now, just... I guess we've to hit on three, Mike. For the sake of clarity for the audience so they can maybe dive in and do a little bit of their own research, what are the other four? Mike Drues: Well, sure, that's a good question, Jon. And I'll pick through those in just a moment, but as I listen to what you just said, I was reminded of the old adage. If the only tool that you have is a hammer, all of your problems tend to look like nails. Mike Drues: So I think, regrettably, to a lot of folks, certainly not everybody. I am admittedly stereotyping here and there are exceptions. But to a lot of folks in the medical device industry, I think the only tool that they have in their regulatory tool box is the 510(k). And they might have heard of the de novo screwdriver, or the PMA pliers and by the way, if they've heard anything about the PMA, as you and I have talked about before they've probably been advised to stay as far away as they possibly can from that, which I think is regrettable as you and I have discussed. But those are the three biggies by volume. Other pathways to market in no particular order include the humanitarian device exemption or HDE, that's sort of the medical device equivalent to the orphan drug program, for those that are familiar with that. The CD, the custom device exemption, which is a very uncommonly used pathway to market, but it's one of my favorite pathways to use when I can. The compassionate use exemption, which is now part of... Oh, I'm embarrassing myself, Jon. I knew you were gonna ask me this question. Jon Speer: Well, I didn't mean to put you on the spot. Mike Drues: No, fair enough. I'm trying to remember the... What used to be part of the expanded access program, I was looking at... I don't wanna mislead our audience, but bottom line, we have done other recordings and other webinars on this topic, and we can provide this to the audience, but there are seven different major pathways and by the way, underneath each... Underneath many of those seven different major pathways there are a number of sub-pathways. So for example, under the 510(k), as you know, there's the traditional, the special, the abbreviated and some people might even include now the alternative 510(k). Under the PMA there's different sub-pathways and so on. So by the time you do the arithmetic, Jon, there are more than seven... More than 20 different pathways that we can bring medical devices to market here in the United States. Mike Drues: I hear people say sometimes, that it's more difficult to bring a drug on to the market, here in the US, than it is a medical device. And in some ways that's true, but in other ways, it's really not, because in the drug world depending on how you count, and I do a fair amount of work on the drug side, as well. There are only three or four different pathways to bring a drug onto the market here in the US, whereas for a medical device as I just said, we have more than 20 different pathways to choose from. And don't even get me started, if we really wanted to kick this up a notch or two, Jon, when we talk about combination products. So a combination of a device and a drug, on the device side, we have more than 20 options, on the drug side, we have three or four or perhaps even five options. We do the arithmetic now the possibility, the possible ways that we can put all these things different together can be quite frankly, overwhelming, but there are a lot of different options to choose from. Mike Drues: Jon, I'm sorry to go backwards. Just for completeness. I did remember the seventh pathway, I omitted a moment ago, and that is the Product Development Protocol or PDP, which is a very uncommonly used pathway to market. But it's similar to the HDE and the PMA, its for class three medical devices. And again, it's one of my favorite pathways to use when it's appropriate. So that for the sake of completeness, that's the seventh pathway. Mike Drues: That was just last week, Jon. Jon Speer: Yeah, right. But anyway, I remember we would look at the regulatory pathways for different projects that we were working on, and more times than not, if the decision tree lead us down the path of a PMA... And I worked for a big company at the time. If it was a PMA, we would almost kill the project immediately, because of the perceived cost, time, all the burden and hurdles that we were gonna have to go through. So I know a lot of companies they'll use that as part of their decision tree that if it's a PMA class three device, kill it, it's not worth pursuing. So I know you have a different opinion about that. Do you wanna share some of your thoughts? Mike Drues: Yeah. In a nutshell, Jon, very regrettably, I would have to agree with you. I have worked with a number of companies as well, where as a matter of company policy, if a device is or it might be a class three and as a result to PMA. They will simply not work on it, they will not pursue it. And I find that to be very very regrettable. First of all, I think it's really holding us back as an industry and indeed as a society, when you think about it, Jon, the PMA devices, the class three devices, are among some of the most important medical devices that we use. These are often devices that are life supporting or life sustaining. In some cases it's very simple, if the patient has access to that device, they live, if they don't, they die. So for companies to take on that policy of simply not pursuing a medical device because it's a PMA, I think that's very regrettable. And I think it's regrettably also, Jon, becomes a convenient excuse for our industry to hide behind. Think about it this way, in the drug world, if drug companies made that excuse about the NDA, the new drug approval for example, or if biotech companies made the excuse for the BLA, the biologics license application, those are both sort of equivalent to the PMA. We would never have a new drug, or a new biologic on the market. Mike Drues: So I think it's very unfortunate that companies and a lot of other people, including investors, they're so fearful of the PMA, because they think it's more time, it's more work, it's more testing, it's more risk and in many cases that is true. But remember, we're talking about devices that are class three, we're talking about devices that are usually technologically more complex than class two or class one devices we're talking about devices that usually are indicated for much more severe disease, oftentimes the path of physiology is much more complicated, oftentimes the patient has comorbidities. So the fact that it takes more time and more testing and so on should be common sense, but nonetheless I think these are all solvable problems, that these are not problems that we as individual professionals or companies, or as an industry should hide behind. And the last thing that I'll say on this topic, Jon, 'cause this is yet another topic that we've talked about before. Mike Drues: I think that the assumption that a lot of people make that it's more work to do a PMA device than a 510(k), or even a de novo device, although there's a lot of truth to that, but it's really not that way. In my opinion and, to be fair, Jon, this is a very unique view in the regulatory community. In my opinion, the amount of work that a company needs to do to bring a product on to the market when it comes to bench testing, animal testing, clinical testing and so on, is not a function of the regulatory pathway. In other words, it should not matter if it's a 510(k), de novo, PMA or anything else. What it's a function of, is the technology of the device, how well established it is, it's a function of the disease of the path of physiology, it's the function of risk, it's a function of a lot of different biological and engineering related things. It should not be a function of the regulatory pathway. And a lot of people think that PMA devices are more difficult just because it's a PMA. But that's, I think, an over simplification. Mike Drues: And there are as I mentioned a moment ago, some significant advantages of a PMA. One is, when it comes to competitive regulatory strategy, if you're working in the grey area between class two and class three, you can go either way, it might be tempting for you to go class two and do it as a 510(k), or even a de novo. But now you've eased the regulatory burden for those following in your footsteps. Because they can do a 510(k) off of your de novo or your 510(k). But instead, if you set the bar a little higher, if you go the PMA route, now the burden for your competition is much higher, and I've seen it happen before, Jon, where a small or a startup company will find out that the device that they're working on, their competition just went through the FDA and they did it as a PMA that could cause them to instantaneously review their regulatory strategy. It might even cause them to shut their doors and go out of business today. Mike Drues: That's a very significant advantage. And one last small advantage and then I'll love to hear your thoughts on this, Jon, in the PMA world is, although the user fees for PMAs are much higher than they are for 510(k)'s and even de novo's, the first PMA is free. So there are some incentives for companies to do this. That's a very long-winded response to your question, Jon. What are your thoughts? Jon Speer: Well, I just thought it would be good to kinda put a wrapper on this and provide a bit of a summary for folks. So first of all, we dove into the words clearance versus approval versus granted. Clearance 510(k), approval PMA, granted de novo. Yes, the words do matter. So for those of you who are involved with getting products through FDA processes, make sure you choose the right verb as far as it pertains to your particular product. Don't use cleared for a PMA, don't use approved for your 510(k), and so on. So that's important, do use the right terminology. The second point is, there are multiple pathways to the market, there are seven top level, if you will, pathways for medical device, and then there are sub-levels that set underneath each of those. So be aware of what each of these options are because the 510(k) may seem like the only path or the only option because it's the most ubiquitous doesn't mean it might be the best option for your products so that means that, or I would suggest to you that you do some competitive regulatory strategy and if you wanna know more about the options, the pros, the cons, the different pathways, and why one might be better for what you're doing than another. And you're stuck and you don't know where to go. I would highly encourage you to reach out to Mike Drues with Vascular Sciences and he can provide some context and certainly be a resource to help you out. So, Mike, any final words before we wrap up today's podcast? Mike Drues: Yeah, just one last thing to mention, Jon, and again I greatly appreciate the opportunity to talk with you and your audience today. We've talked about the importance of terminology, and to some people, the terminology is very important. But please notice I'm using the word, some people, I'm not using the word to all people. So clearly to regulatory and quality geeks like us, working in companies and at the FDA, terminology is important, certainly to attorneys, product liability attorneys and to the US Supreme Court these terminology is important. But let's be honest, Jon, think about it this way. If a physician or a surgeon is using your particular medical device do you think he or she is going to know or, quite frankly, even care whether the device was cleared, granted, or approved? Probably not, and if they did, by the way, I would wonder, "Gee, maybe they have too much time on their hands. Why are they working on me?" Right? So to some people the terminology is important, but not to everybody and at the end of the day, safety and effectiveness of any medical device is gonna be a factor of many, many, many different things. But one thing that I guarantee it will never be dependent on is, whether it was clear, granted, or approved. Mike Drues: I just wanna put things in perspective here, yes, terminology is important. And as we've talked about today, these are things that we should be aware of and should be discussing, but let's also remember how these things fit in in terms of the importance in the global scheme of the universe. Jon Speer: Yeah, it's a really good point. And folks, the regulatory pathway that you choose, it's not a short cut for the work. And Mike's been very clear about that today, and I wanna make sure that you understand there's still the prudent engineering, there's still the effort that is required to demonstrate that your product is safe and ultimately, you wanna be able to demonstrate that that product works, as well. So don't look at a regulatory pathway as a short cut to minimize the type of work that you have to do. It is still your responsibility to prove and demonstrate that that product is worthy of being used on patients. So take that seriously. Mike, I wanna thank you very much for the clarification today and helping provide some insights to our audience on the difference between clearance and approval and granted, and folks, as I said, if you are looking for some assistance on that competitive regulatory strategy to better understand the options that you have on getting your medical device to market, you should reach out to Mike Drues with Vascular Sciences. Jon Speer: This has been Jon Speer, the host, founder and VP of Quality and Regulatory at Greenlight Guru, and you have been listening to The Global Medical Device podcast.